Not just any old model railway, this one is something special. 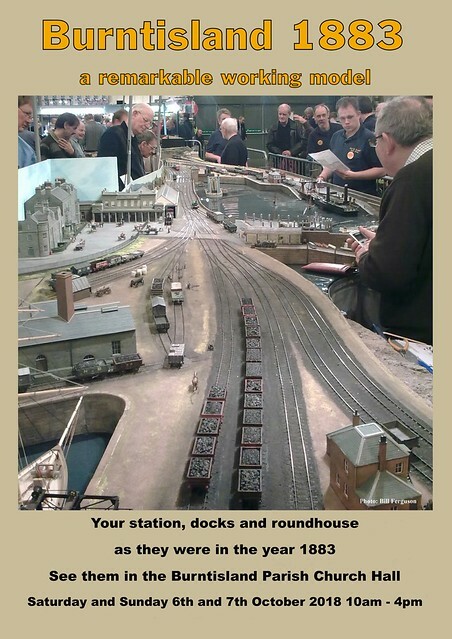 Not just ‘based loosely on Burntisland some time ago’, this is a highly detailed – as accurate as possible – scale model based on an important time in Burntisland’s history. It’s before the Forth Bridge was built and Burntisland was the terminus of the Edinburgh and Northern Railway. The original terminus building is now offices – restored by FHBT. Passenger travelling to or from Edinburgh took a ferry to Granton. Freight was carried across the Forth on the world’s first train ferry. At that time Burntisland had a locomotive workshop and a very distinctive roundhouse steam shed. This has recently been completed by the East of Scotland 4mm Group. The layout was last here in 2010. Report and photos on Burntisland.net. A video from 5 years ago.